As Orson Welles famously said: “The enemy of art is the absence of limitations.” But limitations play a vital role in far more than just art: constraints are at the heart of all kinds of innovation. Consider this scenario: It’s fifth grade. You’re in art class. The teacher points to the closet, brimming with all kinds of art supplies, and offers no direction except “Make something.” Maybe you do — or maybe you exit class an hour later with nothing to show for your time. But, alternatively, what if the teacher handed you a 36” x 48” sheet of paper and instructed you to draw your bedroom from memory using only a red pen? 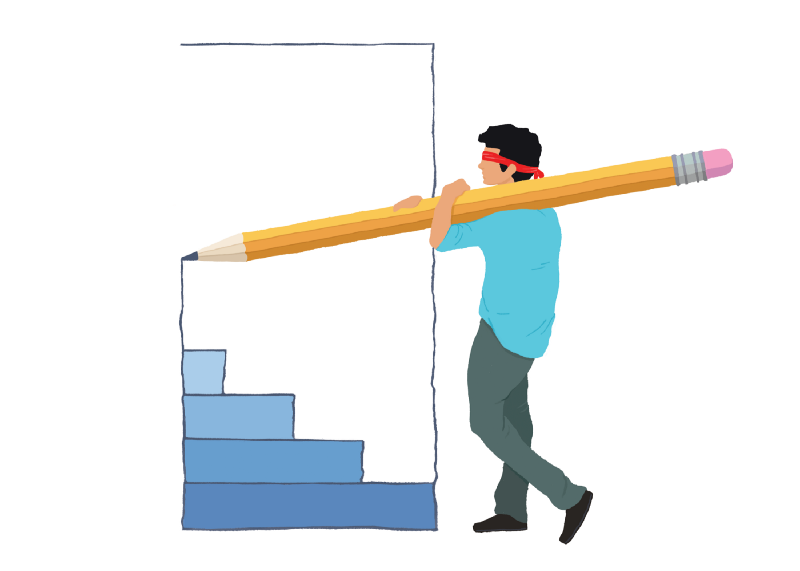 Each of the components in the latter scenario — the size of the paper, the writing utensil, the delineated image — represents a specific constraint. And together they create boundaries that aid the creator in producing better work. On the surface, it seems paradoxical to suggest that limitations — of time, money, human and natural resources — can be in any way beneficial, but research suggests that such constraints are actually crucial to creative output. While involuntary limitations such as Hansen’s shaking hand can certainly inspire innovative approaches, many others in the business world are calling for self-imposed constraints to boost productivity. Technology executive Marissa Mayer points out that constraints can actually speed up corporate progress. “By limiting how long we work on something or how many people work on it, we limit our investment,” she writes in a Bloomberg article in 2006. Limited investment means that more time and money can be spent on a wider variety of ideas, thereby increasing the chance of success. In the tech world, there are some very big players with seemingly unending resources. While some believe those players will continue to dominate the future, their vast resources may actually end up working against them. Tech giants have spent billions of dollars in the past trying to solve some of the world’s biggest problems, often to no avail. Perhaps their failures weren’t due to a lack of resources, but to a lack of constraints. Our tech pattern. All of our ventures must utilize cloud computing, sensor integration, mobile capabilities, and our A²I platform. Ensuring our venture companies use these four pillar technologies keeps us focused and ensures we’re taking full advantage of all of our resources, including our libraries of reusable components. Setting aside ideas that do not benefit from our tech pattern speeds up our progress and leads to better results. Our model. Once assessed, each of our ventures run through a venture development pipeline — a phase-based maturation model that begins with ideation and ends with the venture “leaving the nest.” Upon completion of each phase, we assess the venture’s progress using our built-in “go/no-go” process to determine whether or not to continue with the project. These checkpoints allow us to build in time constraints for each project, thus limiting our investment and limiting the risk of each venture. Our design strategy. For design and development, we use time-constrained processes like design sprints to help us arrive at the best solutions sooner. We also rigidly maintain specific design constraints unique to each project and it’s user stories — whether it’s limitations on scope, on technology, or on accessibility. Our focus. At Aspire, we believe not in incremental but transformational change. That’s why we limit our investments to companies that will have a positive impact on the world, with special emphasis in precision medicine. Supporting ventures that share our passion for changing the world hones our focus and creates more synergistic value between our ventures. Whether self-imposed or externally manifest, constraints will always be present — it’s not a matter of how to get rid of them, but of how to convert them into advantages. Conventional wisdom advises us to think outside of the box — but if it’s the right size and shape, why should we waste energy and resources thinking our way out of it?